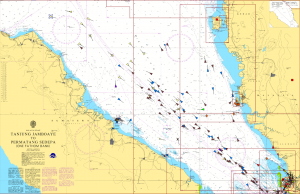 The system allows persistent locating and monitoring of vessels and moving objects in a special area via VHF technologies. The vmsTRACK is a small portable position transmitter, which broadcasts in a pre-set time interval via VHF radio. By means of the transmission contained information about current position as well as curse and speed over ground of the object, persistent real-time-tracking and monitoring is possible for a base station. Such a base station only needs a special tuned receiver unit to get these position reports. Creation of a so called “closed user group” is possible with this system, in which only the base station has the permission to look into. Special areas can be programmed into the unit where not to enter or not to leave. So called “Geo-Fence-Areas”. If the unit will be stolen or tampered, an intelligent high tech solution will trigger a flashing LED to inform the vessels Captain as well as a special information message is send to base station immediately. Transmission will run according to the world wide standardized AIS system (Automatic Identification System), but on special proprietary frequencies which are not used for AIS. The regular AIS radio traffic will be not disturbed or interfered by the position reports of the vmsTRACK units. The real-time-knowledge of “who and where?” is very important in administration of coastal fishing fleets as well as in coastal boarder security issues. By transmission of special names and unit IDs “friend or foe” identifying is possible. Also afterwards the track of the vessel is stored within the vmsTRACK itself if a map is programmed. The small vmsTRACK has got an additional emergency distress button. By triggering the alert function, additional to the regular position report on special frequency, an official emergency message will be send out on both regular AIS frequencies to reach every AIS receiver within transmission range of the vmsTRACK. The vmsTRACK units can be individualized by means of programming ship name, type of vessel as well as area of activity into the unit for transmission. The pre-set time interval is free to define. Two seconds up to 1 time per hour, everything is possible. As bigger the time gap is, as longer the battery capacity will be. E. g. once per minute will last for a couple of days. The power supply for the vmsTRACK unit on a small fishing vessel can be realized by solar panel. This will continuously charge the transmitter. To be waterproof to a depth of 10 meters is nearly needless to say for a product in the maritime branch. What is needed to run the vmsTRACK? Each object going to be monitored needs a vmsTRACK. The charging station provides intelligent and ideal charging which ensures the long lifespan of the batteries. For monitoring all the moving objects in your special area you only need the easyTRX2 Receiver as well as a terminal to display the incoming position reports. Other VHF receiver will not work with the vmsTRACK. The vmsTRACK is factory preset to a custom frequency for “closed user groups”.